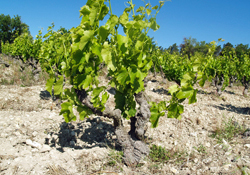 Adopt-a-Vine in France. The perfect wine gift for a red wine lover. Adopt some organic vines at one of our partner vineyards. The Gourmet Odyssey Wine Experience gives you the unique opportunity to become a winemaker for a winemaking year. You'll adopt your own vines and follow the making of your own personalised bottles of organic red wine at one of our partner wineries. All of our partner wineries are organically certified. As such, you'll discover the traditional methods used to cultivate the vines and make wines that respect the environment. You'll meet passionate and dedicated winemakers that each have their own story to tell about how and why the converted to organic farming. The essence of the Wine Experience is to get to know the winemakers and learn about winemaking in a very direct and hands-on way. Through the newsletters and Experience Days at the winery, each valid for two people, our winemakers are by your side to explain the joys, challenges, and reality of their profession. They are there to answer your questions, and get you involved in different tasks such as pruning, harvesting and blending, so that you can learn first hand all of the effort and skill that goes into making a quality organic wine. You can choose to adopt-a-vine and follow the making of your red wine from one of our partner vineyards listed below.